The umbrella has taken on a mythical quality in the world of film, being used as an invaluable means of transportation for the magical Mary Poppins and an ingenious tool for bringing down warplanes, à la “Indiana Jones and the Last Crusade.” Yet, the umbrella really needs no such hype, as its original function is already plenty useful. For small businesses, it’s also a fantastic marketing tool. Rainy days are often the culprits behind unpleasant commutes, canceled outdoor events and plenty of wet clothing. In other words, rain is the problem, and umbrellas are the answer. Businesses that have the wherewithal to stamp their names on umbrellas and deliver them as promotional products to potential customers will start to associate themselves with simple, helpful solutions. Pass out enough, and companies won’t even need billboards – a rainy day becomes a special marketing blitz. Feb. 10 may be National Umbrella Day, but the holiday can be celebrated any drizzly afternoon throughout spring. Companies that doubt the value of useful advertising should take a look at the winner of last year’s Promo Grand Prix winner for outdoor advertising. According to Business Insider, IBM released three billboards as part of its Smart Ideas for Smarter Cities campaign, each of which served a different function on city walls. One was a bench, another was a ramp and the third was a rain shelter. Particularly ingenious about the billboards were their simple shapes, the shelter and the bench basically being inversions of one another. The billboards, developed in conjunction with the advertising agency Ogilvy Paris, received press from Wired, AdWeek and other organizations in addition to recognition from the Promo Grand Prix. According to Wired, the ad campaign merged simple, useful construction with iconic IBM graphic design. It also faced a number of bureaucratic hurdles, as the unique billboards would have had to comply with city ordinances when hung in public spaces. Instead, IBM reached out to private owners to display the signs. Most small businesses probably don’t have the funds to implement such a large-scale advertising project. Yet, one of the lessons to be learned from the advertising campaign is that a simple but innovative marketing strategy can pay off in dividends. At the very least, it seems to indicate that people enjoy a thoughtful advertising strategy that makes life a little easier. Umbrellas aren’t high-end billboards, but they can definitely provide a service to customers and increase brand visibility. 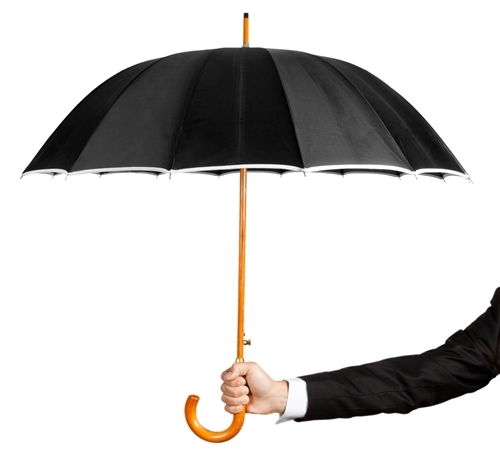 Part of the success of an umbrella marketing campaign depends on ingenuity. Instead of simply plastering a brand name on the umbrella, companies should consider making customized promotional products by developing short slogan that makes the umbrella stick out. Banks, for example, can make reference to their ability to help customers start rainy day funds. Security-based companies could emphasize the value of protection through any sort of storm. Slogans that reference solutions, problem-solving, preparation and forward-thinking are all ripe for clever and memorable word play. Businesses need only have a brainstorming session to come up with something halfway decent. Umbrella marketing can be memorable for more than just well-coined phrases. Businesses can take advantage of bad weather as a time to implement guerilla marketing campaigns. When it rains, it could be worthwhile to have staff stand outside their place of business or in popular pedestrian areas to hand out umbrellas to walkers in need. In addition to being a kind gesture, it all but guarantees a little bit of free advertising, as those caught in the rain will have little choice but to open up until the rain stops.